By LUDWIG VON KOOPA - You didn't see them yesterday. After reading how I got my license, King Dad decided to one-up me. From what I remember, Wii Party U is literally using sound-effects from the Mario Party series. Donkey Kong Country: Tropical Freeze being delayed IS tragic. I initially thought there was new footage associated with Satoru Iwata's sad news, but no, it's from the E3 trailer. How will the Wii U sell in Christmas NOW? Mario & Sonic At the Sochi 2014 Olympic Winter Games literally advertises the sochi.ru website in its logo. That's cognitive dissonance right there. Oh, and Sonic being in Smash 4 makes me as angry as I was back when he was announced in Brawl. Perhaps even more, since his terrible, uninspired moveset looks exactly the same. "Why the hell is Pikmin 3 here", I thought when I watched the Direct for the first time. ...I'm still kind of thinking that. Who cares. The "Tropical Forest" level is just mocking "Tropical Freeze". Let's skip ahead... to Phoenix Wright: Ace Attorney - Dual Destinies! Actually, let's not. I'm going to write an article just on that shortly. Because I'm ABSOLUTELY THAT EXCITED. Let's go to some substantive commentary here with The Legend of Zelda: A Link Between Worlds. Now, besides spending 40 seconds talking about Nabbit and Ravio, Iwata talks about something interesting. "Reconsidering Zelda conventions." Iwata's idea of innovating this convention is the following. From what we saw in the footage, Link was put into this dungeon that was dedicated to the Hammer. You did EVERYTHING with the hammer. Is this really a better approach? Now with the power of non-linearity, dungeons can't really get progressively more difficult. You know, the same way that Pokémon Gold/Silver are screwed up with the level balance. When people say a game is linear, it should NOT be an insult. Will A Link Between Worlds be like Wind Waker or Skyward Sword where you use most or all of your weapons in every dungeon? Obviously not. Puzzles will be quite one-sided. And the surprise of the Direct is Kirby 3DS, which is Mutant Mudds with Kirby characters. ...Yeah, not really psyched for that at all based on what we got. So all and all, like the last big Nintendo Direct, it's the Ace Attorney series to the rescue. How? Wait for my next article. Ludwig is on Miiverse, as you should know. His NNID is PrinceOfKoopas. Go Follow him. 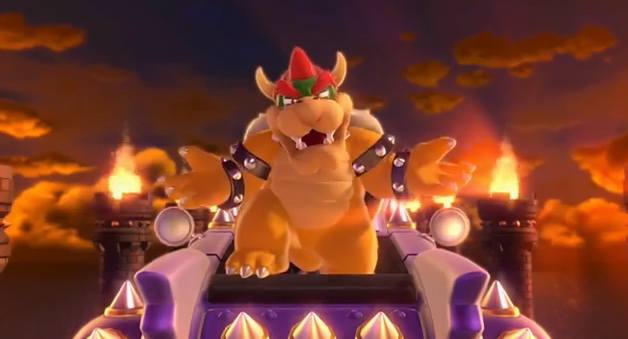 King Bowser's amazing car returns in an article... about cars! Obamacare Not Like A PlayStation 4? Shut Them Up By Shutting Them Down! KoopaTV Now Has a Twitter! Cities and Pokémon Mascots — Full Explanation!